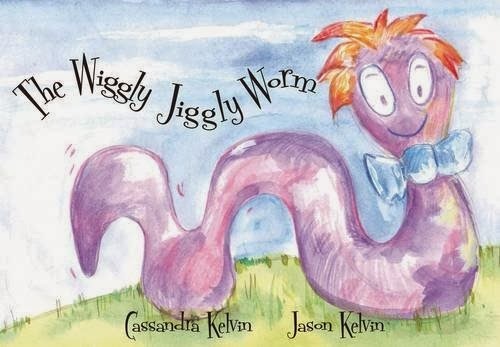 The Wiggly Jiggly Worm is a lovely children's story book from first time author Cassandra Kelvin and illustrator Jason Kelvin. Both of my girls (aged 1 and aged 4) enjoyed The Wiggly Jiggly Worm... so much so that Holly stole the book and sat and "read" it alone in her bedroom with a big smile on her face. The Wiggly worm wants to be like his friends the butterfly, the mouse and the frog but I guess the moral of the story is that it is OK to be different from others and that we are all individuals who have our own qualities that we should be proud of. It is a clear moral that my girls both understood from the first day that we read the story, but it isn't patronising or preachy! The story reads very well - I always prefer a rhyming story book that I enjoy reading as much as the girls love listening too. I found that the words and the text flowed well and the rhyme wasn't strained. The illustrations are fun, bright and engaging. I loved the painted style of the images and the purple worm really stood out so that both girls recognise the worm the minute that I lift The Wiggly Jiggly Worm out of the bookcase. The Wiggly Jiggly Worm is aimed at preschoolers but I think the book is just as suitable for me to read to my younger daughter as my older one and I can see that they both enjoy it. I also think that it has several years worth of interest in it. It is a short book, in a small paperback format but I think it is a bargain at £4.99. The Wiggly Jiggly Worm is available from Waterstones.com and online from the Wiggly House website in both paperback and audio format. It is also currently available on Amazon. You can follow Wiggly House on twitter.